Wow! 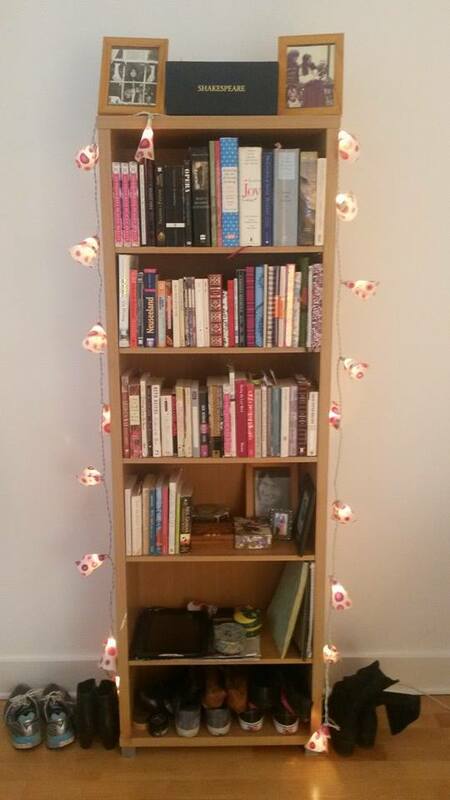 It has been nearly 2 months since my last blog post which is a little scary. I hate taking a break and being away from it for so long. When I mentioned this to a friend the other day she simply said: ‘Take it easy on yourself. You have just moved countries and started a new job. A break will be good for your creativity.’ Now that I have found a day job in an office in Dublin city centre and have my first week of work successfully behind me, I finally feel at leisure to write. And where to start? There is so much to write about! I have been in Dublin for a month now and it has been an interesting month, to say the least. This city is pulsing with energy, the weather has been fantastic and every day confirms to me that my decision to move home after 20 years abroad is a good one and the timing is right too. I do not miss Berlin yet. And what about the phenomenon of ‘reverse culture shock?’ Well, I am not feeling it at all. I feel very happy to be home. I feel I belong here. The worst reverse culture shock I have experienced was in the first few days when I looked the wrong direction crossing the street and nearly got run over by a bus. But I have got used to that now too. Mace, pepper and salt are now wanted alone. Some say you must turn it, some say you must not. The poem continues to delightfully instruct you on what fish to add and to let it simmer. I remember reading it in Berlin and looking forward to coming back to Ireland and eating chowder. 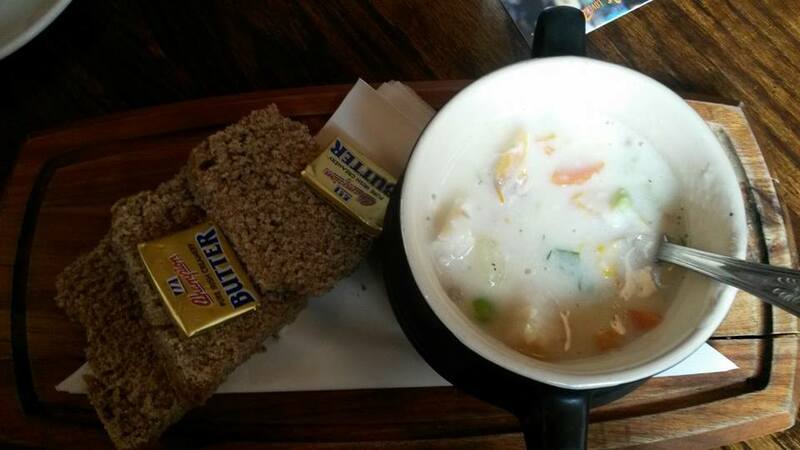 There is a lot of great chowder to be had in Ireland and it is one thing I really missed when away. Within a few days of being here I met a friend of mine in Sheehan’s pub in Dublin city centre and ordered a bowl of delicious chowder served with soda bread and Irish butter. After eating it I went home and fell into a deep and satisfied sleep. The fresh sea air makes me sleepy and even the seagulls with all their squawking don’t manage to keep me awake for long. The sound of seagulls makes me happy. It reminds me that I grew up near the sea and now I have returned to the sea. This is another reason I haven’t been writing: I have been tired, so I have been getting plenty of sleep. Aswell as sleep, I am getting plenty of exercise. The biggest joy is that I have only been on two buses since I got here and as I live so centrally I can walk everywhere. And this is a good thing that I will keep up, as given the whole range of delicious food on offer in this city I will need to walk a lot to burn it all off. 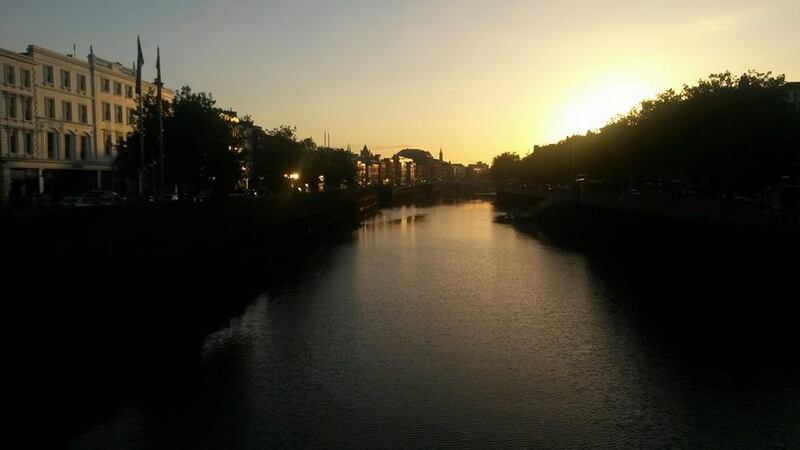 After work last week, I walked across the Ha’penny Bridge which is right near my office and walked over to the Temple Bar area to explore around there. 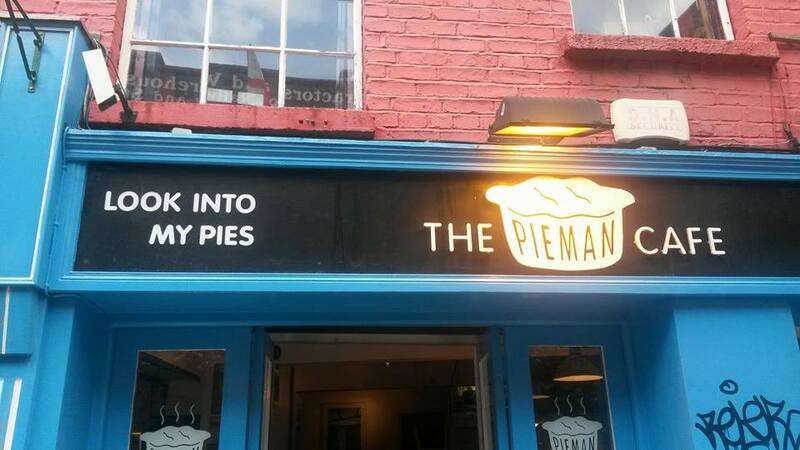 I immediately stumbled upon a pie cafe. 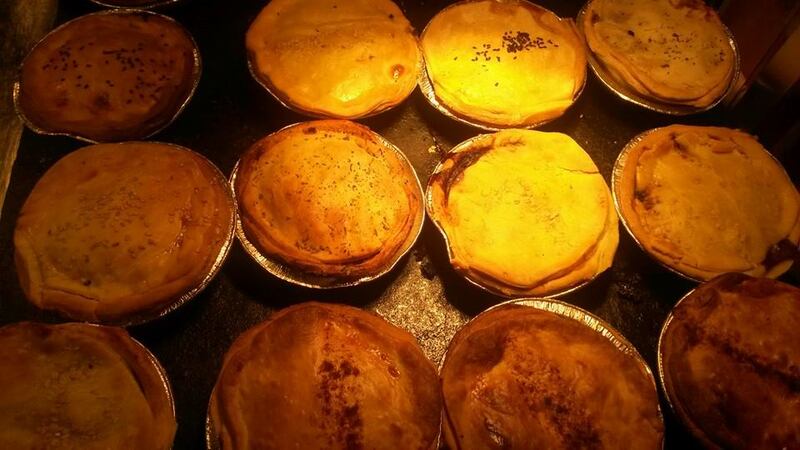 I walked in with a big smile on my face and said with delight: ‘You have pies!’ A delightful woman behind the counter said ‘We do indeed!’ So I sat down and sampled one of the many delicious pies they have on offer at ‘The Pieman Cafe’: chili and chorizo, beef and Guinness, ham and leek, chicken and mushroom plus many more. They even had an apple caramel pie served with fresh cream. Lunch prices are great too as there is a lot of competition in the booming Dublin restaurant scene. In my first few weeks here, I was unemployed and job searching, so naturally I was not wasting money on restaurants, but shopping at my nearest Aldi and cooking and eating at home in between sending out my CV to many companies, but now that I have a job I feel I can splurge a little and treat myself. On Friday night I met an old friend at the wonderful Cornucopia Vegetarian cafe on Wicklow street in Dublin city centre. 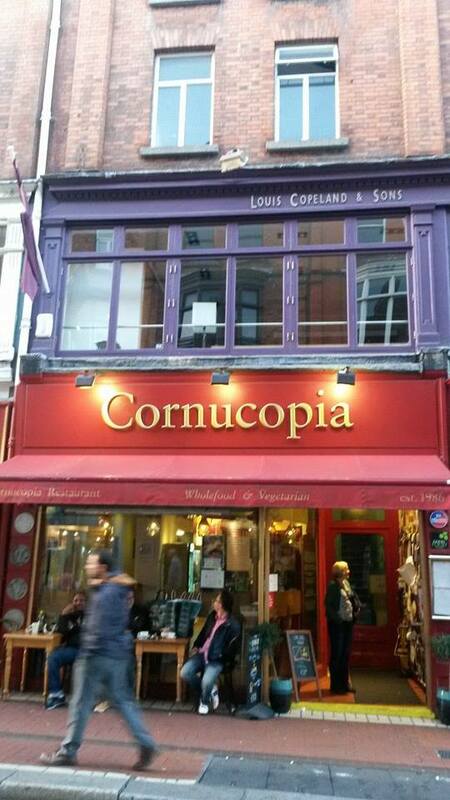 Cornucopia, which is housed in a gorgeous old Georgian house, has been in business since 1986 and they serve a fabulous range of vegetarian and vegan foods. We ordered potato salad, hot pastry pockets, green salad, aubergine bake followed by hot fudge brownie and white chocolate and lime tart. The staff are super friendly and it really is hard to decide what to order from their mouth-watering range of foods. Across the street from Cornucopia is Murphy’s of Dingle (Co. Kerry) Ice Cream shop. They proudly make all their ice-cream from the cream from Kerry Cows, a breed of cow that is rarer than the panda. The ice-cream flavour that has been all the rage the past few years internationally has been salted caramel which I love. 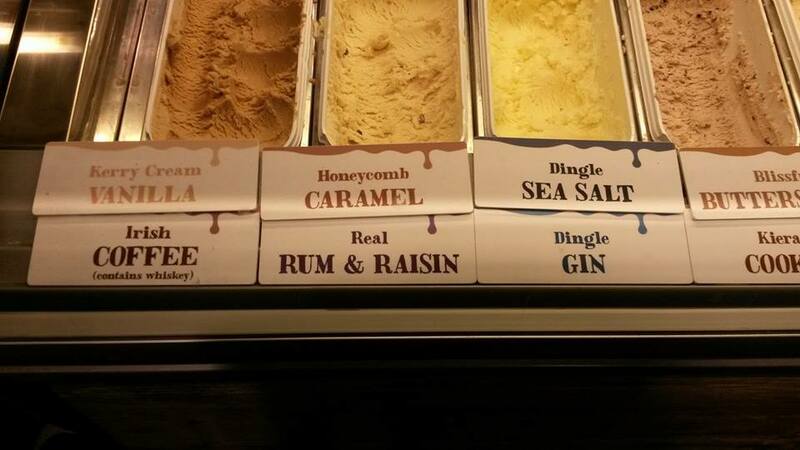 Murphy’s do a Dingle sea salt ice-cream. I also tried the butterscotch. It was heaven. And again: served with a smile. There are so many new sensations, sights, smells and sounds. I will get back into cultural writing and reviews soon enough, but right now I think I need a meal, a walk, and another long nap, for I may not be suffering from reverse culture shock but it is an adjustment and a big life change. So far, my move home is working out better than I could have imagined. And the delicious food and long naps are sweetened even more by one big thing: the fact that I am surrounded by old friends and family, for that is the primary reason for moving home.